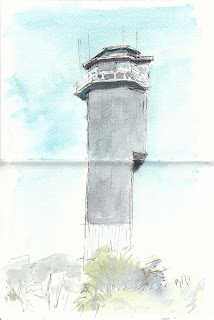 Kind of an un-lighthousey looking lighthouse - this one shows up in some of my sketches now and then from afar. Spent this past week driving out to Sullivan's Island since I hadn't really been out there in awhile and it's not all too far from the office where I work. Check here for information if you're interested.